Back in July I started growing my own herbs. I was finally fed up with buying a whole bunch of fresh herbs only to use a little bit before it would go bad. The final straw was the day I trekked to five different stores before I was able to find fresh mint, and even so, only a small packet of it. 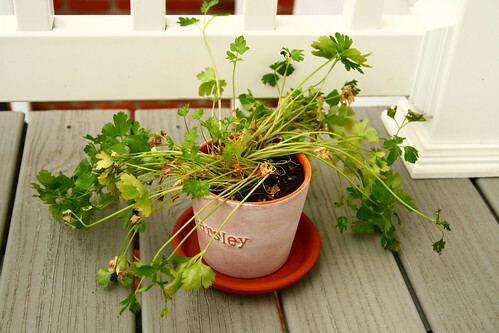 Problem was, I was never known to have a green thumb. I have never had a garden in my life, nor did my parents, and I promptly killed the first thing I ever tried to grow - potted roses that R. got me for our first Valentine's Day. But the one thing that gave me some hope was an orchid plant that a friend gifted me three years ago that is, miraculously, still alive, even after the traumatizing event of moving it to three different temporary apartments en route from DC to Pittsburgh. I thought maybe I was finally ready to tackle something that required more frequent care than once-a-week watering. 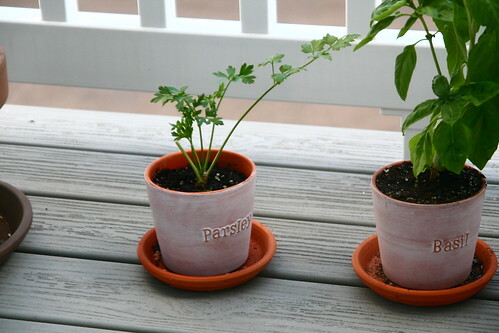 I started with some basil and parsley, and eventually added mint to my patio herb collection as well. (More on the mint in a later post.) 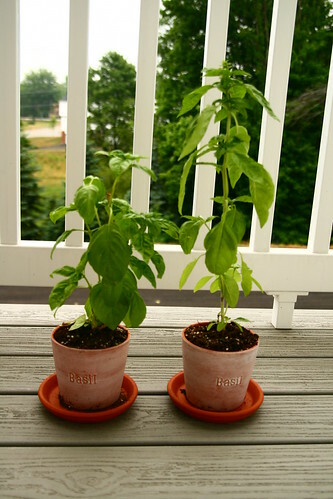 The basil had grown some during the three weeks I had them before I left for Italy. But still, did I have a surprise waiting for me when I got back after 12 days! The basil had grown so much I hardly recognized them as my own! Wow-ee! I'm so lucky to have friendly, wonderful neighbors who took such good care of them while I was away! 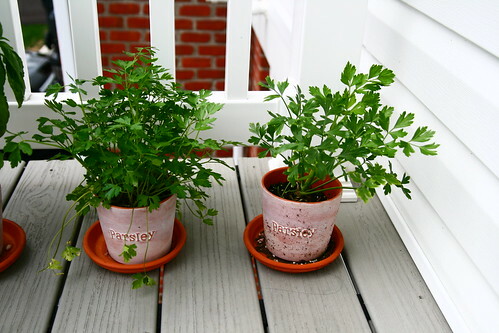 Yep, the one on the left is the original pot I had. It was beyond belief that not only was it still alive, but it was thriving, after being so close to certain death. The pot on the right is the newer one, and it, too, grew like a weed while I was away. I am so proud of my babies! But now, what to do with this much herb? 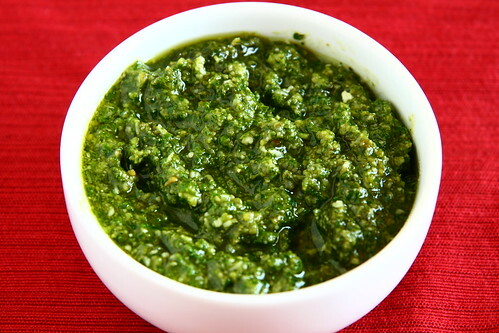 R.'s mom suggested that I make pesto. She listed the basic ingredients, but just to be sure, I consulted a recipe online to get the relative proportions right, and added parsley as well like R.'s mom suggested. And so last weekend, I set out to make my first pesto ever, with herbs I grew myself! I couldn't be more proud of me. I know for many people this isn't such a big deal, but it really marked a significant step for me. 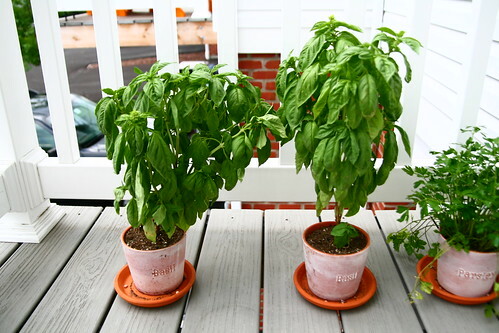 Just three years ago I barely cooked anything beyond spaghetti with meat sauce, and now I have gone from a self-proclaimed plant-killer and non-cook to making pesto with basil and parsley I grew on my own patio. (*tear*) I feel as if I have achieved a whole new level of foodiness. It is a simple recipe, really. 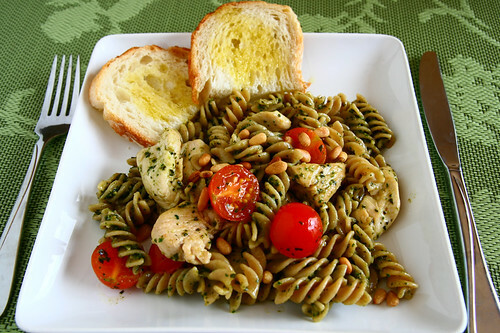 Fusilli, thin-sliced thicken, cherry tomatoes, tossed with pesto and topped with toasted pine nuts. But it's very good, if I may say so myself! :) The full recipe can be found in the link below.